An interesting article on one of my favorite websites, AlterNet.com. It's about the author going dumpster diving for food in NYC. It's not just for the homeless anymore. It's also for people who call themselves "Freegans". So what does being a Freegan Mean? 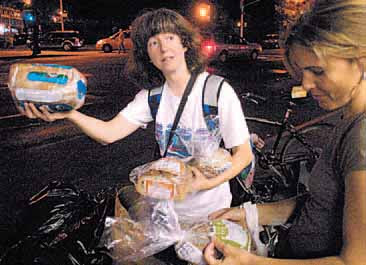 The Author tries just one part of freeganism- dumpster diving. It's something I have done before, but never for food. It's cool. Dumpster diving is like going on a treasure hunt. I used to go behind some of the big office buildings in New York, and see what they had thrown out. One night, near the federal buildings, there was a whole dumpster of used computers, software, and computer parts. WOOO HOOO! I called my buddy Peter, and we scavenged everything useful we could. There were enough parts to make about eight useful computers. Then there was my friend Crazy Louie, the tree-fingered Guatemalan. You could call him a Freegan, I guess. He practically made a career out of dumpster diving. His apartment was almost completely furnished with stuff other people were throwing out. Every time I was there, he had another discovery to show me. It it was good stuff, too, not junk! Even the clothes he and his family wore were salvaged from somewhere. One time I was working with Crazy Louie. We had been renovating some apartments in the South Bronx, near our neighborhood. We were driving past a vacant lot, when all of a sudden, he stomps on the brakes, squeals the tires, and starts backing up. "What the-? What are you doing? ", I say. "Did you see that? ", he says. "See what? I don't see anything?" "There's three quarter inch plywood sitting in that lot. Help me get it into the station wagon." Sure enough, there were four or five sheets of three quarter inch plywood in good condition laying hidden in the weeds of that lot. How he ever saw them, I don't know. Hopefully, we didn't take some homeless guy's mansion material. Freegans also forage- Which I've done for wild plants and mushrooms, and enjoy immensely. If I wasn't already married and expecting a child, I probably give serious thought to living a Freegan lifestyle. I agree with it from a moral and philosophical point of view, but would have to do more research to get the total picture on what it is all about. I guess I could probably live a modified version of the lifestyle. That is, if my wife would let me!